Oh No! I have an emergency with my horse, what can I do?? As a horse owner, that sentence has likely crossed your mind a time or two. There are numerous occasions that can lead to an equine emergency, and are certainly stressful for you and your horse. When you encounter a possible emergency situation, it is best to remain calm and contact your veterinarian for further advice. Remember that during these situations your horse can be stressed as well so make sure to keep yourself safe at all times. 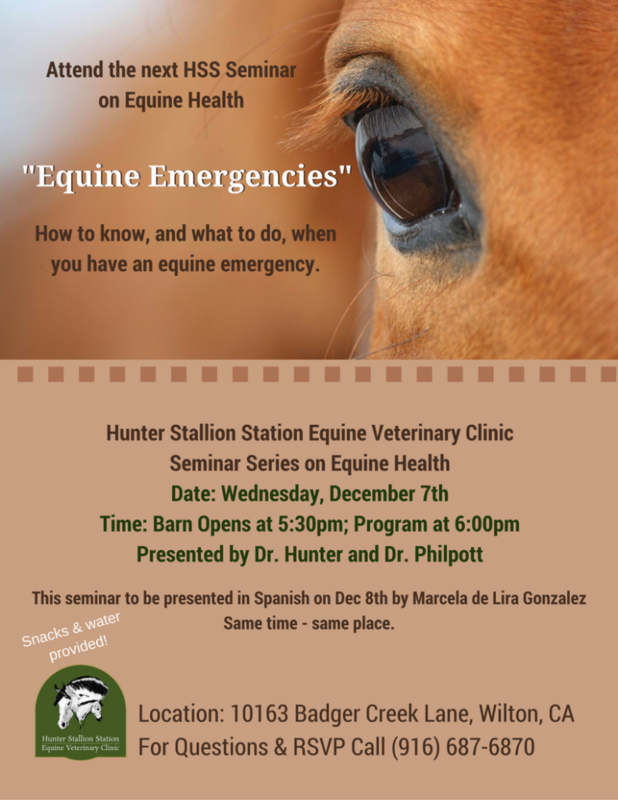 Come join us at Hunter Stallion Station on December 7, 2016 at 6 pm for a short educational seminar on what the most common emergencies are and what you can do for your horse while you are waiting for your veterinarian to arrive.